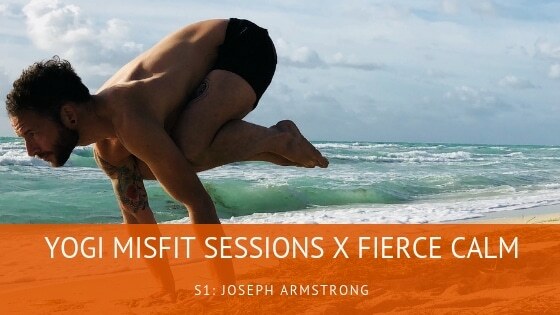 Tribe, I’m excited and honored to present to you the inaugural session that is a collaboration between the Yogi Misfit Sessions and Fierce Calm. Each month, we’ll bring you a compelling story about how yoga has saved a life, with bonus mini stories on yoga’s ability to heal and transform. Fierce Calm is an growing collective of yoga practitioners from all backgrounds and abilities who have each identified with the words ‘Yoga Saved My Life’ and come together as a movement to inspire & empower each other without judgment and with compassion. This is something that I think we can all stand behind. I’ve got Joseph Armstrong on this show, and he shares his story about how yoga profoundly affected him. Having a history of drug usage, he hit a wall with IV meth usage, bringing him to an impasse. With the help of the 12 Step program and ashtanga yoga, he shares his journey of transformation towards a new life. Stay tuned at the end for two mini stories from Tasha and Maria, too!